First of all I must admit that I have never been a BJP supporter nor I am writing this article because I happen to be a Mitra too. Gwalior had been a Parliamentary seat of Atal Behari Vajpayee. He studied in Gwalior and visited Gwalior unofficially whenever time permitted him to do so. His nephew is a legislator and saffronisation of certain mohallas of Gwalior had been due to Mr. Vajpayee’s active interest in the local politics. I remain unaffected. In the course of last few weeks as the Jaswant Singh episode unraveled, I felt that BJP is now in a situation which might have to divide between people like Jaswant Singh and his comrades who would wish to carry the BJP to a dimension without the Hindutva flag attached to it and Rajnath Singh’s group who would have the old BJP with its RSS and Sadhu backers. It seems inevitable but later in the last few days, everything boiled down to Kandahar and Lal Krishna Advani. The media of which NDTV remains a major force seems to be doing a witch hunt on Lal Krishna Advani’s responsibilities during the prisoner exchange at Kandahar. Bitter words which no respectable politician would use were flung on TV channels by Mani Shankar Aiyer of Congress I and Barkha Dutt. Sometimes, makes us hard to believe that Congress I would allow such venomous outflow against a political colleague. I had heard similar words used by CPI leader Atul Anjaan just before the elections. He lost miserably. 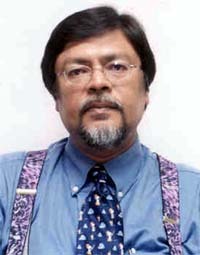 During all these days as I remained glued to the television and Skype phone, one person who earned my respect as an intellectual and remained unfazed in desperate situations is Chandan Mitra. An Oxford educated Marxist and a Rajya Sabha nominated Member of Parliament of BJP, he is the Editor and Managing Director of the Pioneer news paper from Delhi. Really, it has nothing to do with party lines nor with Jinnah or Nehru, but it has everything to do with the façade of respectability that politicians wear but slips off in such occasions. Chandan Mitra did us proud by bringing us to understand the real Advaniji who would cry after seeing the Tare Zameen Par. I too cried after seeing the movie. He gave an insight on Advanaji who had to make an unhappy decision on Kandahar. Farouk Abdullah the then Chief Minister of Jammu and Kashmir agreed to it. BJP as a political party whom I would never vote, is going down on a rapid spiral. I feel disappointed as millions would feel. My close friend Brijendra Tiwari ‘Munna’ lost in the last legislature election from Gwalior Girdh. He was contesting on a BJP seat. He lost in spite of the Madhya Pradesh that went to BJP. People in his village need more than the Hindutva, they in fact need jobs, transfers and financial help. India needs a strong opposition and the need of the hour is to keep the BJP together. I have seen too many so called democracies in the world where the opposition is just a fable. Kandahar, Jinnah and such pseudo resolute happenings should be kept only as footnotes as India moves ahead in giant strides towards a glorious future. It is necessary that we take our brotherly neighbors with us in becoming a power to reckon with.